Your skin is a beautiful canvas, but not all of us received even brushstrokes. NOW Solutions Vitamin C & Oryza Sativa Gentle Scrub involves minor enhancements to leave skin feeling exfoliated and looking balanced. Offering a natural and gentle solution to combination skin with minor colour imbalances, dull appearance, uneven tone, or light scarring or imperfections caused by problem skin. Vitamin C & Oryza sativa Gentle Scrub is formulated to provide gentle, effective exfoliation of damaged skin cells to help restore a more even skin tone and healthy complexion. Vitamin C, Niacin and Aloe Vera penetrate the skin to unclog pores without irritating sensitive areas. Rice bran (Oryza sativa) beads provide natural exfoliation while protecting skin from future damage. I bought this to pair with the Vitamin C cleanser, but maybe it is a little bit too gentle as my skin did not feel exfoliated after use. Will not purchase again. I LOVE it. Gentle scrub that doenâ€™t irritate or dry out skin. Smells fabulous! I tried it for the first time tonight and already love it. Left my skin smooth and smells good! This is the best face wash I've ever used, and affordable!! I've seen amazing results in under a week of use. I have a lot of acne scarring, it has reduced already!!! And my pores are clearer, even the stubborn ones are more easily removed with my black head tool. This product is amazing!!! A great gentle scrub made of natural based ingredients. Great citrus aroma. I use it while doing facials and my clients love it. I am very pleased with this gentle product. It is effective and leaves my skin feeling fresh. Will continue to buy this product. This scrub has good ingredients but I felt that the chunks of oryza sativa (rice) were not enough to give a good scrub and they were too big. It does brighten and leave the skin feeling clean, but it's not my holy grail scrub. I was using Now Foods microderm. scrub and liked it as a once a week treat. This scrub however is much more gentle and is now my morning face cleanser and exfolliant in one. The rice bran beads can be tricky to get out ones hairline so I would suggest shower use only. 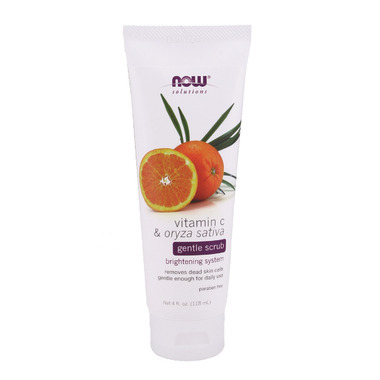 Mild citrus scent, very gentle exfoliation and leaves my skin clean but not dried out. Very pleased.